Executive Summary: Downloadable PDF cheat sheets you can use to facilitate the meetings of Scrum: Sprint Planning, Daily Scrum, Sprint Review and Sprint Retrospective. At the link above you can download the cheat sheets I use in my Scrum practice. The cheat sheets aim to help you facilitating Scrum meetings and make sure that the script is always the same, familiar one, so everybody involved knows what to expect, what to do, and what not to forget. This is the flavor of Scrum I use and teach most of the time, with some tools and techniques you might or might not use. Feel free to modify it to what fits your situation the best. Scrum events: There are five events defined in Scrum . The four meetings detailed in the cheat sheets and the Sprint itself. Responsibles: For every action I write the suggested responsible person(s) in blue. Being responsible for an action means to ensure that the action is carried out. It does not mean that the given person has to perform the task alone. Scaling: The cheat sheets are compatible with scaled version of Scrum, e.g. Scrum@Scale or SAFe. For scaled Scrum, the sheets should be modified a bit by keeping in mind the scaled artifacts (e.g. higher level backlogs) and scaled roles (e.g. Chief Product Owner, Product Manager, …). Planning Poker: The sheets reflect my personal preference to do Planning Poker with physical cards. There are other methods and tools that could work just as well for you. Kaizen: A single process improvement action that will be in the focus of the Team during the Sprint. Satisfaction Metric: I use standard Uno cards for recording the individual and team satisfaction. Meaning of the numbers: 5 – OK, 1 – Nothing stops me from quitting tomorrow, 9 – I’m actively pushing my friends and family to join the team/company. 1 — 3: Not satisfied, 4 — 6: OK, 7 — 9: Satisfied. Note: You shouldn’t handle the Satisfaction Metric as it would be some objective metric — it is very subjective by nature. But it’s a great conversation starter for the Retro. 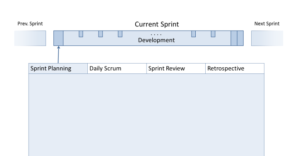 Scrum Board: This can be any well-visible, single or multiple information radiator(s), like a physical Scrum or Kanban Board or a virtual board in a project management system.